Many of you have probably heard that starting a new lawn is hard work best left to professionals. However, you can be successful starting a new lawn from seed and save your money. All you need is quality seeds suited to your area, a little preparation, well-prepared soil, and, of course, a little patience. It won’t cost you a lot to transform your garden or home with a new lawn, if you start a lawn from seed. The best time to start lawns from seed is just before the grass’s season of most vigorous growth. Once you have laid out the area where you want your future lawn, it is time to inspect your ground. Before your work it over with a tiller, remove debris and large rocks. The goal here is to break your soil down to marble-sized particles, which serve as welcome mats for grass seeds. It is recommended that you mix in a few bags of Scotts® Turf Builder® Lawn Soil, in order to improve your soil quality. Valleys and peaks are something you don’t want in your new lawn. Even out the surface with a rake as much as you can. If you are tempted to bring in new top soil keep in mind that it is not a good idea, because it may contain seeds of weeds which are hard to control. Keep removing any rocks you come across while you rake. It is up to you which goes on first, the fertilizer or the seed. Whatever you choose, use a drop or rotary spreader. All you have to do is follow the settings on the packages. In order to give your grass seeds a head start, you want to fertilize on the same day. Once the fertilizer and seeds are laid down, cover up the seeds with ¼ inch of dirt. This can be easily done by slowly dragging the back of a leaf rake over your seeded area. If you are starting a lawn on a hill, mulch with a thin layer of straw in order to keep seeds from washing away. Keep in mind that you should plainly see the seedbed beneath the straw. You do not want your grass seed to dry out, after all your efforts. All you have to do is make sure that your lawn stays moist through the top inch of soil. Therefore, you may need to water 2 to 3 times each day. However, you have to do this just until your seedlings are well established. Once that is done, you can start watering thoroughly 1 to 2 times each week. 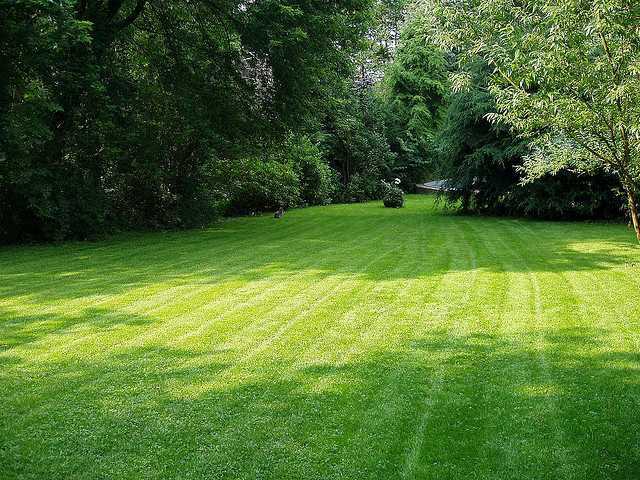 Once your new lawn starts growing vigorously, you have to cut it. Mow only the top third of the grass blades. In order to keep the lawn nice and thick, adjust your mower to a higher setting. Weeds can sneak in when you cut it too short.